A violent saint... A man who claims he is Yama, is punishing sinners by killing them according to the twenty eight hells described in the Bhagavat Gita. Who is he? What does he want? Is he a vigilante or a psychopath? Swati Kaushik, a widow and a woman who can do anything for success, must team up with Iravan to stop the God of Death and Justice. 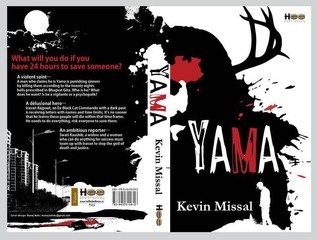 REVIEW- YAMA is the crime thriller novel by author Kevin Missal and is enthralling story. Book Title and Cover- Book Cover is beautiful. I loved the use of black and red colour to signify Yama. Book title is interestingly confusing in positive way. Overall Book Title and Cover are catchy and demands the attention of reader.